The largest Wawa recently opened in center City, Philadelphia. 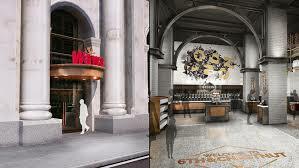 The World’s Largest Wawa opened in Center City, Philadelphia across from Independence Hall. Located at 6th and Chestnut, the Wawa location is adorned with marble and modern finishing, bringing a new look to the private company. The new Wawa opened December 14, 2018. Many visitors from all over came to visit, including Alon Eylon (‘22) from Cherry Hill East. “My family and I went to see the new Wawa a few days after the opening. We went to see it because we heard many great things about it,” says Eylon. The new Wawa is at an 11,500 square foot location, trimmed with white bricks and contains an indoor eating area. The 6th and Chestnut location is one of the few to have featured the cafe seating, where visitors can enjoy their coffee or have a bite to eat. The store is trademarked with a greenery wall covered in plants, large automated screens and Free WiFi for the cafe seating. It also consists of murals from City of Philadelphia Mural Arts Program. The colorful and bright murals were eye catchers for the people who payed a visit to the site. Wawa CEO Chris Gheysens told Philadelphia News that he wanted to show the company’s commitment to Philly, its “hometown,” front and center in its flagship store. Gheysens said the “Philly Firsts” murals are his favorite parts of the new store. During the opening, the coffee cups showed designs that were highlighted on the murals. The new Wawa also features many new things that are not usually included at a common Wawa, like a “Molten Lava Liberty Latte,” instead of your regular Cup of Joe. “This Wawa is a revolutionary step to what we will see in future Wawa’s,” said Lisa Ingersoll, a guest at the flagship store. The new Wawa is located next to the liberty bell as the location hopes to be a new symbol of the City of Brotherly Love. The new Wawa also offers baked goods unlike the others in the Delaware Valley area. Ingersoll says the new pastries were amazing and that she would love try one like that again. The newest Wawa is a unique and fascinating location, mixing art-deco and industrial designs into a tasteful blend.